Canyoneering is a fast-growing extreme sport in Zion National Park and Grand Staircase-Escalante National Monument. It involves navigating canyons by whatever means are necessary including swimming, climbing and rapelling. 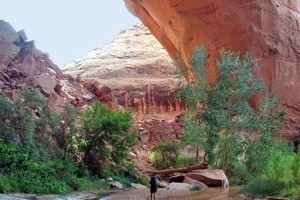 Choose from on-trail day hikes to off-trail multi-day backpacking adventures in Utah's slot canyons. Our expertise helps you find scenic wonders not seen by others. Come see the hidden wonders and natural treasures of the Escalante & Grand Staircase, Bryce, Zion, Arches & Canyonlands National Parks. Choose from camping or lodge options. Join a variety of BOSS courses and learn traditional living skills, preservation skills, survival and self development in the natural world. Mountain biking, fishing, and 4x4 tours! 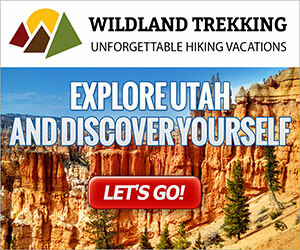 Close to Capitol Reef National Park, Boulder Mountain, the Grand Staircase-Escalante National Monument, and much more! 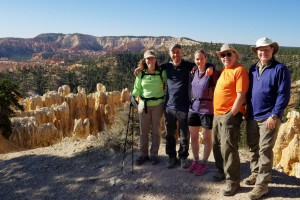 Small group tours (generally 5 guests or less) and private customized explorations of the most beautiful places on Earth, Grand Teton & Yellowstone, & canyons of southern UT. 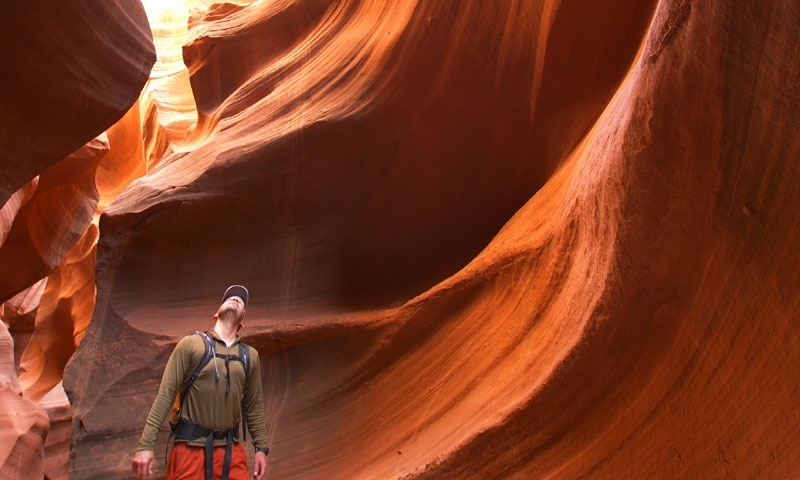 The rugged rocky terrain in southern Utah is riddled with canyons, gorges and caves which provide an excellent challenge for the adrenalin-pumping activity of canyoneering. This testing sport involves swimming, climbing, rappelling, climbing boulders, bushwhacking and clambering in and out of narrow gorges, slots, cliffs and other rock formations. It may include steep hikes and backcountry camping whilst enduring the elements. The Escalante River canyon system with its 400,00 acres of sandstone cliffs, grottoes and slot canyons is the perfect location for canyoneering. From Harris Wash Trailhead, off Hole-in-the-Rock Road Escalante, following the Escalante River Canyon to Coyote Gulch is 70 miles and will take 10 days to complete, or just do a section of it. Zion is a great place in South Utah for canyoneering in the towering sandstone cliffs and gorges of this amazing national park. More challenging trips will include hiking, rapelling, climbing over obstacles and squeezing through narrow passages. 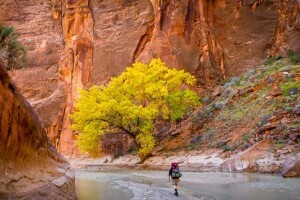 This 9.5 mile hike is through one of the most beautiful slots in Zion. It will involve swimming through several deep pools, short rappels and down climbs. It starts at Wildcat Canyon Trailhead and ends at Left Fork Trailhead. A winding slot canyon that is a tributary of the famous Zion Narrows. It requires short rappels and lots of swimming. A favorite of technical canyoneers, only 12 climbers per day are allowed access. Canyoneers require two 140' ropes, harness descending equipment, emergency ascending equipment, emergency overnight gear and plenty of water to do this hike. This technical slot involves rappels of up to 100 feet, wading and swimming. It will take 4 hours to complete. Canyoneers require a 60-meter (200 feet) long rope.